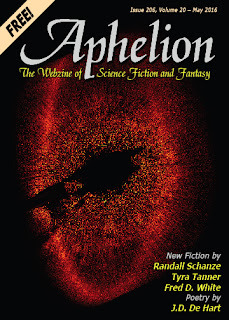 Aphelion is a non profit magazine that provides a lifeline for new writers and those more well known and allows writers to receive feedback on their work. I had been fortunate enough to have been published in a previous issue with my short story, The Tail of the Sea Upon the Thief's Path which you can read here. Aphelion is a monthly webzine that is packed with the latest tales of science fiction and fantasy that is packed with short stories, long fiction, poetry, features and flash fiction. You can read all the issues including this one for free here! This issue features seven short stories and for me the stand out super awesome tale has to be The Voice Catcher by Tyra Tanner. Stacia is no ordinary child she has spent her life living on the edge of the forest which unites people together in fear. This is a forest that must be stopped before it destroys indiscriminately with it's voices and a small team of burners dedicate their lives to go back to the forest's boundaries and protect the city. But what really happens if you succumb to the forest's voice. A really thought provoking tale that is really gripping and original. The tale blends together both fantasy and science fiction and warns us of the prisons we make for ourselves with fear. Tyra Tanner is a full time mum who spends her free time crafting fiction. A sweet little tale written entirely in dialogue full of charm and wit that reminds one of a fairy tale. A young heroic man is captivated by the turnip farmer's daughter and will do whatever it takes to sweep her off her feet. E.A.Moore is a retired architectural designer. Previously he has written for television and radio, is an award winning playwright. His poetry and short stories have regularly appeared in magazines and his first story collection, A Second Coming And Other Stories will soon be published by Friesen Press. There is something so strange about the early hours they have a certain quality where the natural order of the world seems distorted and out of sync. Fortunately most of us are asleep during these strange periods but others like Emanuel and Mark our protagonists in this tale are not. Walter G.Esselman takes us on a high octane fantasy adventure. There's a fire raging in the city of Bon Su Pear but can Gideon get there in time to rescue those trapped? Walter G.Esselman has been previously published many times in Aphelion Magazine as well as Dark Dossier, Schlock, Residential Aliens, Conceit Magazine, Ultimate Writer and Static Movement. A clever tale of the need to belong and experience the kind of protection that only exists within a loving family. Rick Witherow's tales have previously been published in Midnight Zoo, The Best of the Midwest's Science Fiction Anthology and Fantasy and Horror Volume 11. A strange tale of a man living a lonely life far out in the desert told with humour and sadness. It feels like a modern day Robinson Crusoe mixed with the film, Groundhog Day. Peter Cushnie is 72 years old and resides in Connecticut U.S.A he has been writing short stories since 1980 and he has previously appeared in Aphelion Magazine with Honeylips. Some people distance themselves from others for good reasons for they can't stand the pain of loss, but this guy just can't help himself, after all he's only human. Florin Purlaca is a Romnian writer who has previously been published in many Romanian magazines. His short story The Observer was nominated in the 2015 Romcon Festival for Best Short Story of the Year. He has had a short story Dust, published in UK magazine The Singularity.